I started Isle of Skye Cashmere with a simple concept in mind: everyone ought to be able to buy the highest quality cashmere at a reasonable price. The best cashmere sweaters –almost as a rule– are knit and hand-finished in Scotland, and the same Scottish mills that knit sweaters for Chanel and Hermes knit sweaters for Isle of Skye Cashmere. This means that the cashmere sweaters at Isle of Skye Cashmere are as well made as any cashmere sweater you’ll find at Chanel. But it also means that through direct sourcing and low overheads, I’m able to offer cashmere sweaters of the highest quality at a reasonable price. My experience shows that you’d be hard pressed to find sweaters made in Scotland priced more attractively than mine. That being said, there are plenty of cashmere sweaters on the market today that are far less expensive than the cashmere sweaters I offer at Isle of Skye Cashmere. But here’s the rub: these lower cost cashmere sweaters –without exception– are mass produced for companies where standards of construction are lackluster at best. Indeed, companies that mass-produce cashmere sweaters cut costs by making inferior products – cashmere sweaters that sag at the elbows, cashmere sweaters that pill, and cashmere sweaters that are knit at a low gauge. More alarmingly, the workers that mass-produce these cashmere sweaters often earn only a few dollars per hour. Conversely, knitters in Scotland –the knitters that knit for Isle of Skye Cashmere– earn a livable wage; they produce sustainable knitwear; and they adhere to environmental and labor regulations that are similar, if not more stringent, than those enforced in the United States. In short, companies that mass-produce cashmere sweaters make compromises to achieve a lower cost that Isle of Skye Cashmere is not willing to make. The result of these compromises is a compromised, inferior product – a ‘mass-produced’ cashmere sweater in the worst sense of the word. For mass-produced sweaters, the first area of compromise is often raw materials – the cashmere fibers. In sourcing cashmere fibers, it’s true that you pay for what you get. The best, most expensive fibers are thinner, softer and longer. They are therefore less likely to pill. They are also whiter (color purity when dying). When mass-producers want to save money, they start with inferior fibers. These fibers are thicker, coarser, shorter, and therefore more likely to pill. They are also off-white (muddy dyed color). Unfortunately, to the untrained eye, inferior cashmere fibers are extremely difficult to detect. Often, it’s only after wearing and cleaning the cashmere that you’ll notice the difference. The low-quality fiber shows! The sweater looks and feels worn. It has lots of pilling. It’s not as soft as you would like it to be. Nor is it colorful and bright. The second compromise mass-producers make: quality of construction – and here it’s easy to cut corners. Scottish mills –the mills that knit sweaters for Chanel, Hermes, and Isle of Skye Cashmere– use a technique called “fully fashioning” when finishing sweaters. During this process, individual pieces are linked together with cashmere yarn. And this is done by hand. This process provides our cashmere sweaters a flexible, comfortable fit. It ensures that our sweaters will retain their shape. Conversely, mass-producers often do anything but “fully fashion” their sweaters. The third compromise mass-producers make: less cashmere in each cashmere sweater. Mass producers do this by knitting at a lower gauge (density of knitting stitches). The Scottish mills that knit for Chanel, Hermes, and Isle of Skye Cashmere knit 2-ply sweaters at 21-gauge. This gives each cashmere sweater a silky, soft drape. Conversely, you’ll find inferior sweaters are often knit at 15-gauge. This saves money because the lower the gauge, the less cashmere. Low gauge results in cashmere sweaters that are loose and gauzy. These cashmere sweaters lose shape over time. They bag at the shoulders and elbow. The fourth compromise mass-producers always make: they knit cashmere sweaters in developing countries, often paying workers only a couple of dollars on the hour. Isle of Skye Cashmere sources cashmere sweaters from Scotland – primarily from a family-owned company that pays skilled workers a living wage. Further, Scotland has environmental regulations similar, if not more stringent, to those in the US. The steps required to keep the water and air clean are costly. Many developing countries fail to impose environmental regulations on mass-producers. Accordingly, there are few costs incurred to mitigate the impact of production processes on the environment. It is an unfortunate reality, but a reality nonetheless. So the next time you’re looking to buy a cashmere sweater, I hope you’ll keep the information above in mind. Look at the label. Does it say “Made in China” or “Made in Scotland”? These are the values Isle of Skye Cashmere is all about. And cashmere cardigans make living easy. For those cool nights on the Cape, nothing quite compares. Likewise with cashmere shawls: they’ll keep you comfortable, chic. Warm but never too warm, our sweaters and shawls –made with pure Scottish Cashmere– are perfect for those balmy island nights, for those late evening walks down shore. So say you’re fogged in on the Grey Lady –‘Sconset, Nantucket– or maybe you’ve gone out west –the Bay Area– to visit an ambitious, adventurous son (this August mine is married a year! ): a sweater or shawl ensures you won’t miss out on Surfside clambakes, on late afternoon rambles through Golden Gate Park. Lightweight, whisper soft: Isle of Skye Cashmere is clothing to wear with any kind of weather – no matter the coast. It makes comfort and style easy; it gives shelter from the fog. Summertime with family and friends! If only things were always this good! Nothing quite compares to cashmere when it comes to style, not even cotton is so gentle on skin: wear it with jeans, wear it with a dress or slacks and you’ll feel wonderful – of course you’ll look fabulous! But any garment so versatile and comfortable requires a minimum of care. Whether it’s new shoes, a new cut or a twinset, special items deserve special attention. My customers want the best return on their investment, and to that end I’ve always provided instructions: with each sweater comes a note outlining proper care – how to wash it, how to store it, etc. But we all live such busy lives! Kids are off to college, dogs need vaccines and houses demand renovation! Cards get lost (where’s a set of instructions when you need it! ), so I thought to publish my instructions here. A blog ensures they’re easy to access; it ensures your sweaters –thank heavens they’re timeless!– will keep for years. The instructions that follow are simple, straightforward. Taken as a whole, they amount to just a little TLC. Hand wash frequently. Avoid heavy soiling. Rinse thoroughly in cool water until the water runs clean. Squeeze gently to remove excess water. But don’t twist or wring out your sweater. Block carefully into shape. Do not twist or ring the fabric. Dry flat. Avoid direct heat or sunshine. A note about pilling: A few small balls of fiber may form at the surface of your sweater after wearing the first few times. These balls, or “pills,” are caused by loose fiber tangling during wear. Pills can easily be removed by hand. A note about moths: they love cashmere! We suggest that you keep your sweater in a storage bag to protect it. Finally, proper care will ensure your sweater lasts for years! I’ve even found my sweaters’ softness to improve following the instructions above. I know! It’s hard to believe! But you’ll find your sweater’s quality gets better and better. As many of you know, I have closed the Isle of Skye Retail Store while I continue my rehabilitation for my broken femur. My surgeons have told me it will take a full year to rehab, and I take them at their word. During this time, I continue to have the Isle of Skye Cashmere website open. I know my Cincinnati customers prefer to come to the store, so I have decided to open for my valued customers. My store will be open for a Special Sale , Wednesday, September 30 and Thursday, October 1 from 11am – 5:30pm. All Isle of Skye Cashmere sweaters will be on sale at 40% off. My other merchandise will be on sale at 50% off. This will be a great opportunity to stock up on Christmas gifts! Cleveland) to join in this sale. Twist and gorgeous cumberbund sets.” All ThRedHeads merchandise will be on sale at 35% off. purses, buckles and more.” All Girl with Pearl merchandise will be on sale at 35% off. I’m looking forward to seeing everyone! I miss you all! It Starts Today: Help Every Child Succeed in Cincinnati! This is a reminder that Isle of Skye Cashmere begins our in-store fundraising week for Every Child Succeeds today, Saturday, December 3. We will continue from Tuesday December 6 to Saturday December 10. Store hours are 10am to 5pm on Tuesday and Wednesday. On Saturday, we close at 4pm. 20% of all our store sales during this time will be donated to Every Child Succeeds. Over the last 5 years, with the help of loyal customers, I have raised over $60,000 for Every Child Succeeds. With the pressure on our state budget this year, ECS needs support from the private community more than ever. I support Every Child Succeeds because I believe that helping to save a child is the best holiday gift that we can give. Isle of Skye Cashmere specializes in fine Scottish and Italian Cashmere clothing…sweaters, jackets, and scarves. The photo on the left is our Callie Cashmere Cardigan, knit exclusively for us in Scotland. We have other items that make great holiday gifts. 20% of all store sales this week goes to Every Child Succeeds, a Children’s Hospital Program that delivers vital services to children of at-risk, first time moms. These moms are typically unmarried, low income, and have no access to prenatal care. Their children are at high risk for poor health, delayed learning and social development, neglect, and abuse.ECS has proved it helps save at-risk children by lowering infant mortality, creating safe and healthy home environments, and delivering normal learning, language and social development for over 90% of the children in the program. We’re giving away two $250 gift cards at the end of the week. Just stop by the store to register! Please come by Isle of Skye Cashmere this week, and help in my support of Every Child Succeeds! I hope to see you. Je suis revenue de Paris…. I am just back from a great trip – 2 days in New York and 7 days in Paris. 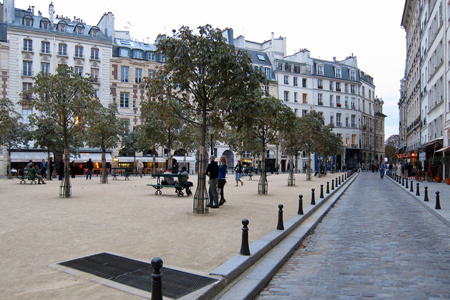 My time in Paris ended in the same place it began – Place Dauphine. Place Dauphine is a small public square on the western end of Isle de la Cite. It was named after “Le Dauphin” (crown prince) Louis XIII, son of Henry IV, and was built in 1609.As you can see in the picture on the left, even when the rest of Paris is bustling with tourists, Place Dauphine is quiet and charming. With cobblestone walks and outdoor cafes surrounding a lovely park with trees and benches, its a perfect place to become re-acquainted with Paris. I always start my visits to Paris with a glass of Chablis at le Bar du Caveau in Place Dauphine. Tourists hardly ever come into this tiny restaurant with 6 crowded tables – the waitress does not speak English and there is no English menu. It’s not my favorite restaurant in Paris, but Le Bar du Caveau is my favorite place to re-immerse myself in the sights and sounds of Paris with a glass of one of the great white wines from Burgundy. And I always end my visits to Paris with a walk through the Place Dauphine at dusk, just to create one last memory for myself of what a beautiful and enchanting city this is. Over the next few weeks, I’ll share a few of the special things I discovered in Paris during this trip.